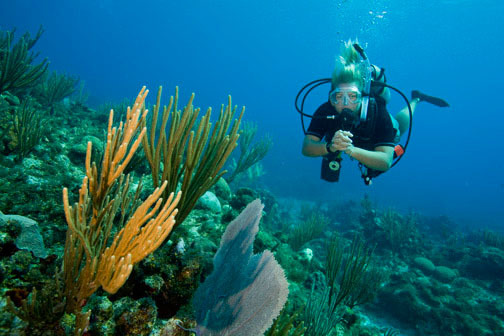 Important factors in feeling relaxed underwater are good buoyancy and trim. We will discuss buoyancy in another blog article but until you have nailed your buoyancy you won't find it easy to improve your trim. For the purpose of this article, we will assume you have enough weight..and no more. So what is "Trim"? Trim is just the word divers use to describe their body posture and position underwater. and it's just as important underwater as it is when walking around. Many divers think of it as having a flat, horizontal posture in the water and this is indeed how we want to be for much of the time. On other occasions, we might need to be able to adopt other positions in the water and when we can control our trim we can comfortably orientate ourselves in whatever direction is best at the time. In the picture here we see a diver with a good flat trim, feet slightly raised for optimal forward propulsion from the fins and not risking stirring up any silt or sand. He is also using good buoyancy control to hold his position in the water. This is actually a snap of Midge, owner of Scuba Blue (he owes me a pint now). So how is this posture achieved? First, you need to know how you swim now. The best method is to get someone to film you while you dive and honestly analyse your posture and trim afterwards. 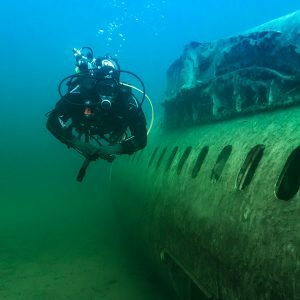 You could also just get a more experienced diver, who does have good trim themselves, to watch you and give you feedback; perhaps you could ask your local friendly dive centre if an instructor or divemaster could do a dive with you - maybe could ask for this to be a focus in a PADI Peak Performance Buoyancy course. Finally, you could try and do it for yourself and visualise what you must look like for yourself and consider what the difference is with the ideal posture or trim. Whatever method you use please be honest with yourself and please accept the critique of others...we often delude ourselves that we are dive gods when the reality is somewhat less glorious! Weight distribution. You should have the correct amount of weight but is it correctly distributed? Typically we put weight in a belt or in pockets on our BCD - close to the waist; we then have air in our jacket which is nearer the chest. Not surprisingly this can lead to us adopting a head up posture. which will lead to greater diver resistance in the water, we have to swim harder and thus we consume more air. Take a kilo, no more than two kilos, out with you on a dive and find a nice flat area, maybe a shallow platform at Vobster. Now hold the weight against your tummy then slowly move it forwards until it is extended out in front of you. Observe what happens. Try the exercise a couple more times. If you feel that having weight further up your body helps with adopting a good flat trim then when you get out it's time for a bit of kit fiddling. Take some weight, a couple of kilos will be enough for now, out of your weight belt or BCD pockets and find a way to fix them higher up your gear; many BCDs have a couple of small pockets on the back for just this purpose. Spookily, they are called "Trim Pockets". You can buy trim pockets and thread them on the cam band of your BCD or wing. Failing those then hard weights will have slots for threading them on a weight belt and you can thread them onto your BCD cam band but that might interfere with tightening the cam band on your cylinder. You will have to see for your self. If you only need to move a little bit of weight forward you could try just moving the camband a bit lower down the cylinder putting the cylinder a bit higher. People who dive wings often say that they help with maintaining good trim and one reason is that they usually have stainless steel back plate weighing in at 2-3kg. This moves weight forward and lets you take a couple of kilos of the weightbelt too. Trim Check time. Right, did that fix it? On your next dive get yourself neutrally buoyant. That means you can hang in the water when holding about half a lungful of air; breathe in and you rise slightly and on exhaling, you sink gently. Now get yourself flat in the water, clasp your hands (to stop you flailing about with them) in front of you, gently bend the legs behind you as you would if swimming. Now try to hang motionless for a minute or so. It's likely there is a bit of fine-tuning to do. You may twist or tip sideways a bit, this may be due to your posture or maybe you have a piece of kit on one side, a pony cylinder, a heavy torch or a reel maybe. You could try shifting them so they are nearer your centre of gravity or move a bit of weight to the other side of your belt to compensate. Finally don't underestimate the power of visualisation; visualise what you look like now in the water, imagine what you want to look like - now move your limbs so they are where they should be. It may feel a bit weird but stick at it and it'll become the natural posture for you. Ankle weights...the devil's invention. OK, there will be divers who really do need ankle weights but I've never actually instructed on any buoyancy workshop or Peak Performance Buoyancy course where they were needed. I am certain they are overused. We are taught to fear getting floaty feet and inverting when wearing a drysuit. Not an unreasonable concern but there is a risk that we are getting floaty feet when actually they aren't. I actually need to shake my feet early in a dive to get a bit of air in my boots to get my trim right. Again, the secret is to get yourself watched or filmed with, and without, ankle weights and I'm fairly sure many divers would be better off without them. It can take a number of dives before you feel properly trimmed so don't be impatient. It will come and then you will be scything through the water, with barely a flick of your fin and with air consumption that will be the envy of us lesser mortals.